We guys started on a beautiful Friday morning, 4 AM. At that time it wasn’t as beautiful, none of us had slept well on the Zeroth Night. Zeroth night is the night before a road trip, hence the name “Zero” and also that is the night you have Zero sleep due to the trip anticipation. And I was a little worried about having to drive all the 1300 kms, other two guys don’t drive! So 4AM, Friday it was! Lama (one of the guys for the trip) came to my place, dropped his bike. We started by 4:15. Since my car had only run 1000kms, I didn’t want to cross 100kmph for a couple of hundred kms. We stopped after Krishnagiri for breakfast in a small shop at 8:30 AM. We reached NICE road and picked up another friend of ours, Navs. We got off the NICE Mysore road and went to Barista for brunch at 10:30 AM. Had lunch at some deserted resto, after Mysore, but the food was good 🙂 We reached Bandipur gate by 4:30. We were really slow at this stretch, taking photos. We reached Masinagudi by 6:30 PM, it was starting to get cold. We stopped for some yummy bujji’s and headed towards Ooty. Reached Ooty, hunted for hotels in the maze they call a road, settled down in a hotel by 8:30 PM. Ordered dinner and crashed by 10 PM. Woke up to the COLD, drizzling, beautiful morning in Ooty, after a 10 hour sleep. And did I mention it was cold! Got off the bed, brushed.. blah blah.. and left the hotel by 10. All I had was the wiki travel list of places to visit in Ooty. But we didn’t have any map. We finished breakfast at a small shack. Smoking hot idlis in smoking cold Ooty. We drove around and ended up in a place near Botanical Garden. Of course we didn’t go in! Another traveler friend of mine had suggested some places – Ooty Tea Factory, Doddabetta, Pykra falls and some other places which I don’t remember now and didn’t go then! Then headed towards Doddabetta. On the way we saw a signage for Ooty Tea Factory. Went there and it was crowded with tourists (including us!). 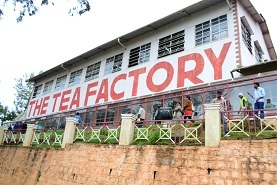 The best about the factory is the tea they offer you after a tour of the factory. Yum it was! And we purchased tea dust there and went to chocolate shop in the same campus. Who goes to Ooty and not get chocolates! We got some rum and raisin chocolates and they were delicious! 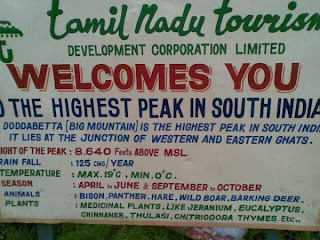 After that, we went to Doddabetta, the highest peak in South India. It was Cold! We had lunch at Dominoes and then we went about roaming Ooty. The roads were awesome, so I did not mind driving around, we chanced upon Pykra dam and falls and one other beautiful valley, the name of which I do not know. We came back to the hotel by 5 PM. Went out, had hot bajjis and chai! We needed to kill time till dinner and switched on the idiot box. Shawshank Redemption to the rescue! Had dinner at 9 30 and and came to the room by 10:30. They guys were seeing True Lies when I slept off, had to drive back! Woke up at 6 and left the place at 7 AM. The drive down the mountain was amazing. Just one stop near connoor for breakfast. See the map for the route we took. 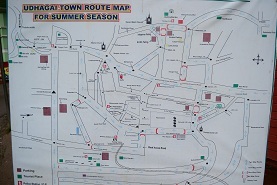 Fortunately I had a detailed Tamil Nadu map with me and that helped us find a really good route back to Krishnagiri. The TN State Highways are two lane roads but really well maintained. It is scenic too! Trying taking those from Gobichettypalayam to Dharmapuri via Mettur. We crossed Cauvery river at Mettur. It’s huge and had water too, that was a surprise to me! We reached Krishnagiri by 2:30 PM and had lunch there. Navs got a bus to Blore from there and we guys headed back to Chennai and reached by 6 30 PM. It took us only 11 hours on our way back but 16 hours on our way to Ooty. Could be because we came downhill or less stops or shorter distance.